As a spinster, I spend quite a bit of time with my boyfriend, Netflix. Usually I watch bunches and bunches of Law and Order, but since this past weekend, I've been watching something a little different. A friend turned me on to this show called The IT Crowd, and I can't get enough. So, now we're going to talk about why I love it. 1. It's from the UK. That's right. Like a lot of Americans, I love the English. They're funny, and I like the way they talk. 2. It's about nerds. Somehow I don't think it's a stretch at all to imagine that I'd be friends with these guys. They're wierdos, and I like them. They're lovable. 3. It's got Chris O'Dowd. 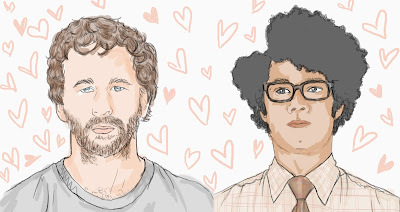 You may be asking yourself, "who is this Chris O'Dowd?" Well, you may remember him as the adorable police officer from Bridesmaids. Offbeat and super cute. Also, we're married. I feel like I should disclose that. But I'm also still a spinster. 4. Jen. The "relationships manager" character on the show is an hilariously real - if farcical - woman. I just watched an episode where she has a terribly uncomfortable bra. I'm pretty sure we all know thats a real and terrible thing. Don't we all hate to be poked in the armpit with a wandering underwire? 5. It's so true. The best thing about ridiculous tv shows is sometimes how hilariously true they are. I know I just said this in #4, but give me a little break, ok? What I'm talking about here is that the IT guys answer the phone and give really obvious answers to whatever the caller is asking. "Have you tried turning it on and off," is the first question they ask anyone who has a problem. Anyone who's ever worked with an IT department knows they'll ask you if you've tried to restart your computer or if you've tried logging on and off. Most of the time, though, you're calling because you'll lose all your work if you sign out or shut down. But really, they don't care. And it's hilarious because it's true. Ok...so now you need to watch this show on Netflix. It's sort of funny in a less-dark kind of Office Space way, which makes it perfect for your sunday night ritual in preparation for Monday morning. Or, if you're recovering from your work week today, you could just watch it all day.